Rep. Keith Ellison is the "Anti-Trump." He's thoughtful, calm, smart, progressive, and he happens to be the first Muslim American ever elected to Congress. He represents one of the most diverse districts in Minnesota, a state known for proud progressives. Progressive Democrats of America (PDA) are proud to have him on our national advisory board, and we stand with Sen. Bernie Sanders, Sen. Elizabeth Warren, and many of their colleagues in calling for him to be the next chair of the DNC. Keith has been a serious fighter for all of our progressive issues. He's committed himself to work full-time in all 50 states as DNC Chair, offering to step down from his House seat if elected to chair the DNC. He's been an exemplary Co-Chair of the Congressional Progressive Caucus. His character and integrity are unquestioned, and he's shown the ability to build coalitions to engineer real change. Please join us as we support Keith Ellison's bid to lead the DNC: sign here and here. Donate $500, $50, or whatever you can now to support Keith Ellison for DNC Chair. "Keith and I have had the chance to work together many times over the past several years. I’ve watched up close as he has pushed hard to try to hold Wall Street accountable through his work on House Financial Services, and he has consistently exercised bold leadership for the Congressional Progressive Caucus. I admire Keith’s values, his grit, and his dedication to making this country work not just for some of our kids but for all of them. I’m proud to support his candidacy for Chair of the Democratic National Committee." 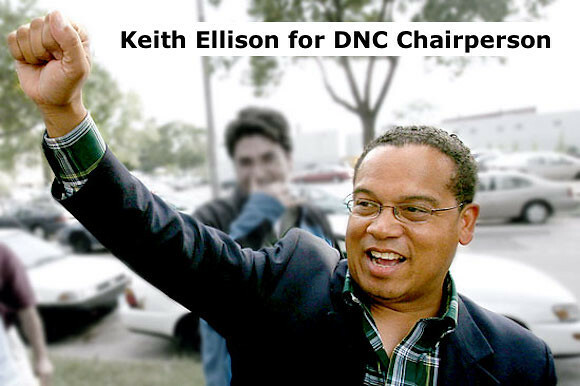 Help PDA make Rep. Keith Ellison the DNC Chairperson: sign here and here. Then help PDA needed progress. Donate $500, $50, or whatever you can now to support our progressive organizing. Money tight? Please contact PDA Field Coordinator Judy Hess now to help launch or strengthen a PDA chapter in your state or locality. Sign up with Mike "Phone Guy" Fox to make calls from your own home. P.S. We're here to help you make progress in your state and locality! If you need help organizing a new PDA chapter or energizing your existing chapter, please contact PDA Field Coordinator Judy Hess. Too busy to volunteer? Donate generously now to support our unabashedly progressive organizing.